Start Your Day On A Healthy Note - Welcome to SarahKesseli.com! For many of us, our day starts with us running around trying to get set for the day. We have little time to kick off the day in a healthy way. 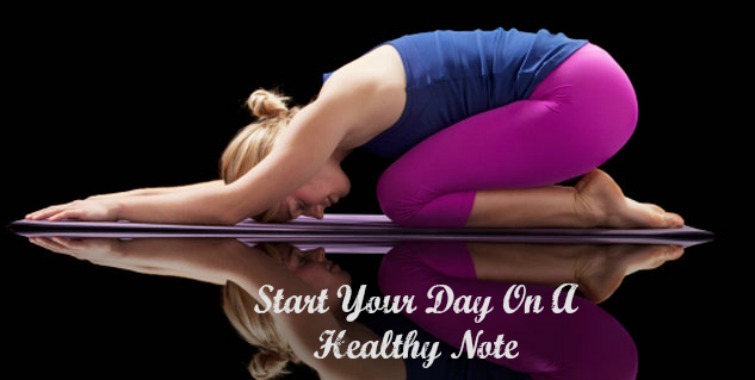 So today, I am sharing a few tips that will help you set up your day for healthy success! Wake Up Earlier – Even just 20-30 minutes is enough time for you to squeeze in some of the following tips! Eat Breakfast – Starting your day with a healthy meal (instead of nothing or fast food) will not only give your body the energy that it needs, but also set you up for healthy eating success for the remainder of the day. Eat Veggies In That Meal – Try to squeeze in some veggies with your breakfast! Something like a veggie omelet is not only tasty, but quick and easy too! Exercise – Get moving even if it’s for 20 minutes! Exercise helps to energize us and increases our endorphins making us feel happy and ready to take on the day! Plus it is great for your heart too! Drink Water – Make sure to keep yourself hydrated! After 8 hours of sleep your body needs to replenish fluids. Enjoy an 8oz glass of water with your vitamins! Stretch It Out – Spend 10 minutes stretching your body. This will wake your body up and help relieve any tightness or stress your have built up in your muscles. Soak It Up – Take a 15 minute bath! Allow your muscles to soak in a warm bath while clearing your mind for the day! When you begin your day with a healthy meal, relaxed body and clear mind you are not only taking care of yourself but setting up your day to be healthy and positive! That positivity will shine on your family, friends and your work! Here’s to having a healthy and happy day, every day!